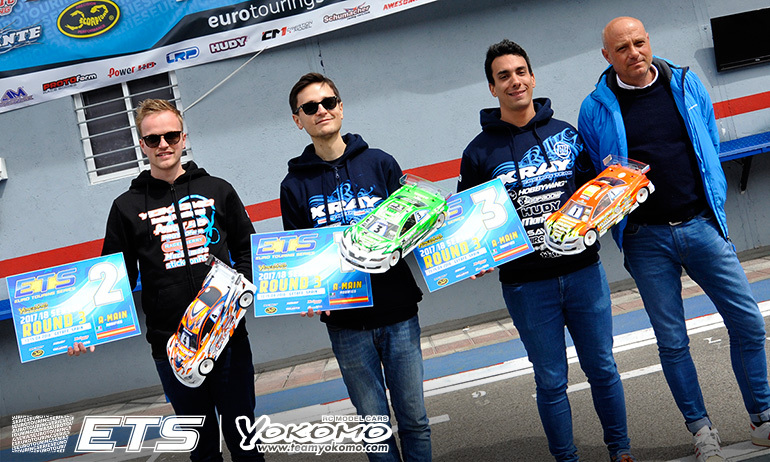 Alexander Hagberg has ended a four year drought in the Yokomo Euro Touring Series, the Xray driver taking victory at the first outdoor race of the season in Spain today. 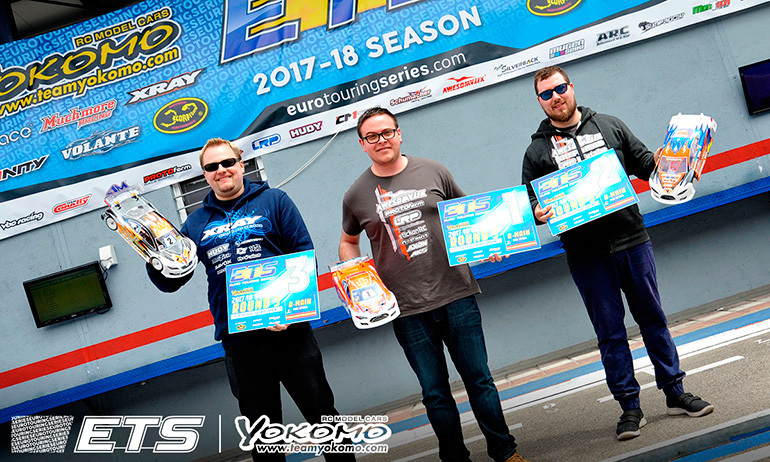 Claiming the last of his ETS wins in Germany in 2014 on carpet, the Swede got his third ETS career win after the result went to a tie break when Christopher Krapp won an eventful A3. 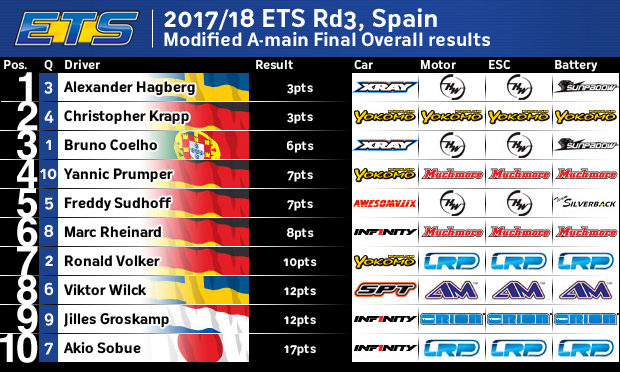 With the overall result coming down to times, Hagberg’s quicker A2 win sealed his first win on asphalt ahead of Krapp and Bruno Coelho. For Top Qualifier Coelho it would be a fraught end to a day that started out so well. Having taken a very straight forward win in A1, a mistake in A2 dropped him behind Ronald Volker before the pair clashed handing Hagberg the win. Leading away the field in A3, another mistake on the curbing, this time on the opposite side of the track, put an end to what could have been a weekend that put his rivals well on the back foot, especially given season opening winner Marc Rheinard was having a tough weekend. 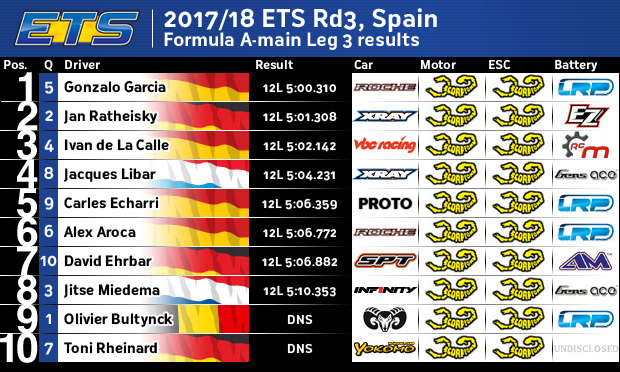 Despite the result, Coelho still leaves Spain now with a 5-points advantage over Rheinard who came into the weekend as joint leader. 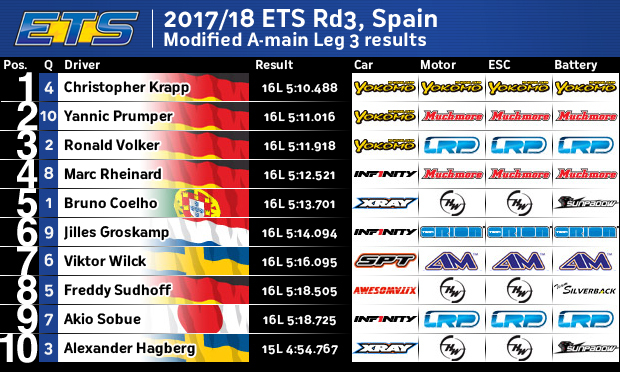 Hagberg’s win moves him up to third pushing Volker, who gave up his A3 lead to try help Krapp get the overall win, back to fourth. Travelling to Spain fresh from winning a record 5th consecutive 1:12 European title, Hagberg said, ‘I am very happy to win of course but it was a very difficult A3 because of the wind which caused me to make a mistake and let Chrissy go’. Jumping from 8th to P3 on the grid with some smart tyre strategy than saw him TQ the final qualifier he said, ‘We knew Ronald would let Christopher through to help him win. I was not able to pass Ronald cleanly so my race was done after that but I knew from the track conditions it would be hard to beat my time. 4 years to finally win again. It has been too long’. He concluded, ‘I feel sad for my team-mate that he had back luck but that’s racing’. ‘For sure I’m happy to get 2nd place on the podium and for the team that Yannic hit fourth but, aagh, I’m also a little disappointed because I feel I could have made it (the win)’. The former ETS race winners’ first podium in a number of seasons, he continued, ‘I don’t know if it was the conditions or me. I tried to beat Hagberg’s time and think I had the car to make it but the last 3-4 laps were perfect so maybe I could have made better driving but overall I’m super happy. Finally our car is in good shape, for sure I’m disappointed for Ronald, but for the Yokomo team it was good to be competitive outdoors again especially when the Worlds are later this year’. Summing up his finals, a frustrated Coelho said, ‘it was not my day for sure’. 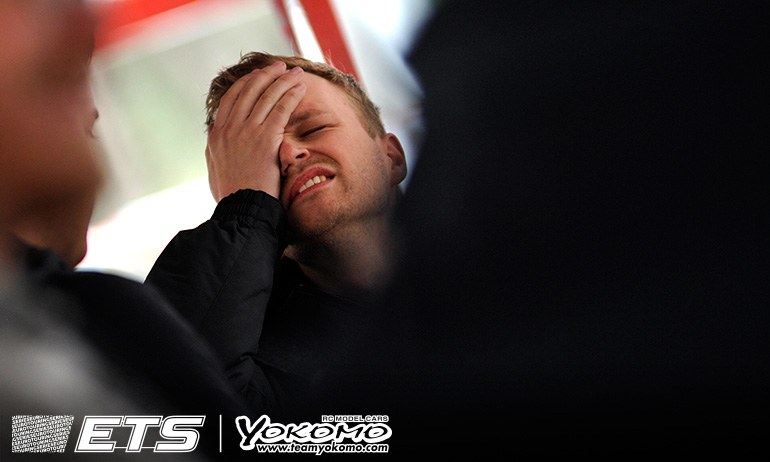 Missing out on 12th ETS career win, he continued, ‘I made a good start (to A3) but touched the curb again. It was bad luck. In all the races I touched the curb there but in the most important race of the day it happened (the car rolled). Some days are just not your day’. Clearly unhappy with Coelho’s comments after A2, Volker wanted the opportunity to react to his rival. 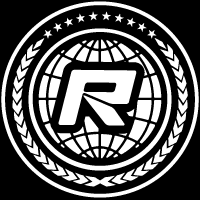 Finishing up with a disappointing 7th after what had started off with a resurgent performance from the World Champion, he said, ‘Just before A3 people told me what he had told Red RC and this totally pissed me off. He said I just had a glitch in my head but I was actually trying to get out of a body tuck. The lack of respect this guy has is disappointing. I’m actually the guy that lost the race’. Commenting on A3 he said, ‘I was easily in the lead and saw a small chance to help my team-mate win without being too unfair. 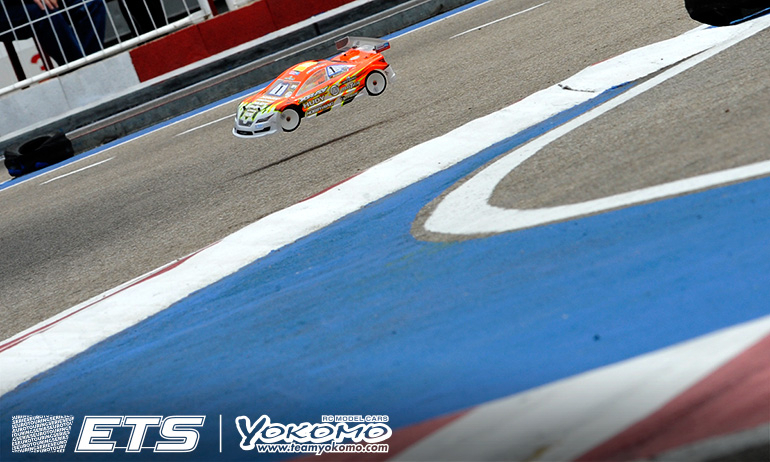 I’m super happy with the performance of our car this weekend that showed we are back with a Yokomo 1-2-3 in A3’. 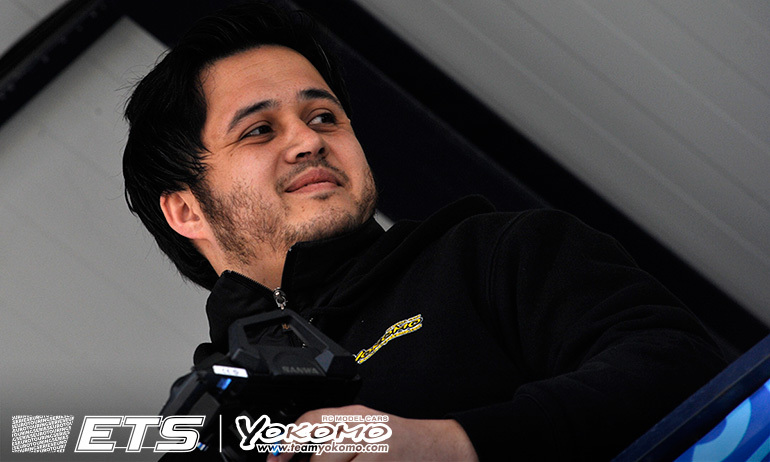 With the Pro Stock and Formula winners determined in A2, the closing A-Main was about the rest of the podium. 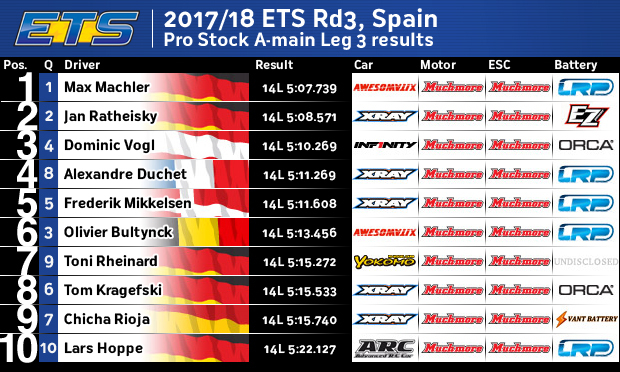 In Pro Stock, winner Max Mächler played the team role for Awesomatix running A3 to help make it a 1-2 overall for the Russian manufacturer. Allowing team-mate Olivier Bultynck to the front only for the Belgian to make a mistake and drop down the order Mächler chased down new leader Jan Ratheisky. 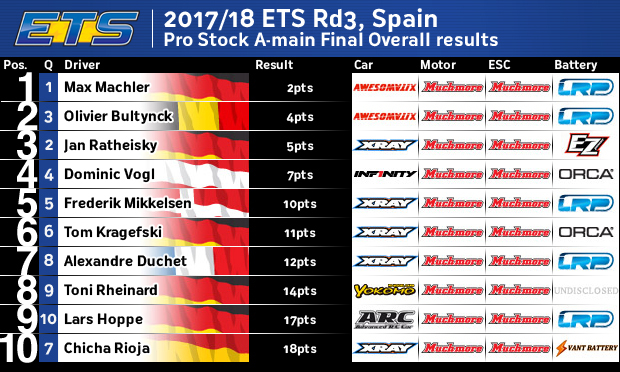 Getting passed the championship leader to complete the clean sweep by preventing Ratheisky from winning A3 he secured Bultynck second overall. 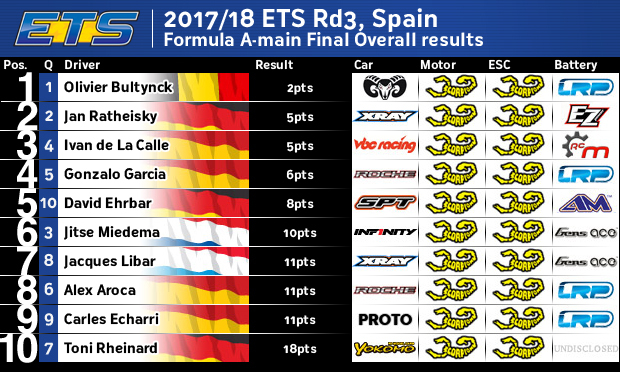 In Formula, Gonzalo Garcia snatched a popular win over Ratheisky in A3 but it didn’t change the podium with Jan Ratheisky ending up second overall to Bultynck while Ivan de La Calle completed the Top 3. In the Masters class there was a photo finish to A3, with Christian Drießle somehow beating Beni Stutz to the loop to claim the overall win. Championship leader Thomas Oehler completed the podium.